Open the Task manager (right click the task bar). Kill the Store app and the Store Broker service. The last one might not be running. Replace [username] with your username. The [garbage] tag can be different sometimes, so navigate to it manually. Sometimes renaming isn’t possible because Windows complains the path is too long. To fix this, open a command prompt (WIN+R and cmd) and type: subst t: followed by the path at step 3. Then navigate to the new drive (t:) and type: rename Cache CacheTemp. Create a new folder named Cache. 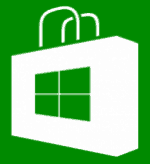 Start the Windows Store to see if it helped. You’ve made my Day!!! I tried all the stuff i saw : troubleshooter ; sfc /scannow ; the erasing store cache option ; a couple of commands in the CMD and non worked. To say that it was so easy to correct that… Thank you so much!!! First time i wrtie something in a forum for a solution but this one is working!! Thank you! Other website were just posting the same steps, and you offered something different what actually worked! thanks a ton! simple and smart solution. Please help, the LocalState folder on my pc is empty. What next do I do please? 2. Clear the stores cache. Hit the Windows key + R. Then type wsreset.exe. Please let us now if any of this solved it for you!